Our crash protection installations can be found across the country, providing security and safety on our roads, car parks and businesses. We provide and install Armco Corrugated Safety Barriers and Open Box Beam Safety Barriers. Both are easy to install and offer excellent durability for substantial impacts minimising the dangers of costly accidents and repairs. They can be used to protect buildings, machinery and pedestrians from potential damage caused by vehicular movement. Corrugated barriers are widely used for traffic segregation, offering vital pedestrian safety and protection for stock, plant and buildings. These untensioned steel safety barriers offer an invaluable line of defence in areas such as car parks, industrial estates and other high volume traffic areas. 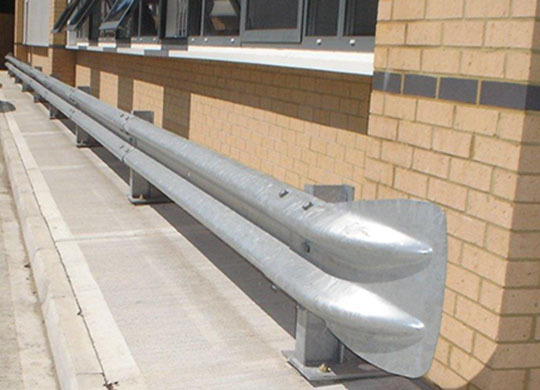 This Armco barrier shows the barrier in situ, with a fish tail end - a recent project with Florey Investments. Open Box Beams are a heavier duty system, particularly suitable where a stronger safety barrier is required, such as highway applications.